The summer is flying by, and we’re almost done with our experiment at Blue Lake. We’re testing our hypothesis that young Largemouth Bass grow faster in habitats with vegetation. Every month we place a new batch of fish in the nets and look for differences in growth rates, diet, and body condition. We’ve already finished our July and August time periods, and recently put the fish into the nets for September. The good news is that with the new turtle fences we’re getting good survival rates in our pens and will have plenty of data to analyze. Just before we netted the August fish I shot some video to better understand behavior of our bass. Check it out below! My observations were that they behaved differently based on their habitats in the net pens. Of course, the scientific method (and my degree!) requires data, not anecdotes. In addition to information about the fish, we collected information about their habitats in the net pens to help explain differences we see in the fish. We have samples for potential food items like zooplankton, invertebrates, and fish. We also collected data on water quality to ensure that conditions were comparable. We’ll work on those back at the MSU lab all winter. Imagine dumping a Ball jar full of muck and plant matter into a pan and sorting through it with a microscope. About a 250 times. So, that will be a post for a later day. 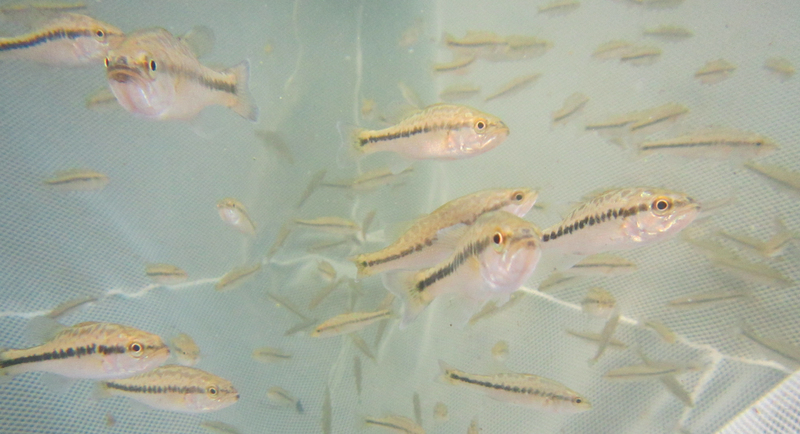 Three-month old Largemouth Bass in our holding pen before they star in the big experiment.